Tamales consist of a corn dough filled with various ingredients and then wrapped in a corn husk or banana leaf and steamed. The dough is traditionally made with lard, which increases the fat and calorie content, but you can make substitutions for this and other less healthy ingredients to reduce the fat and calories in your homemade tamales. 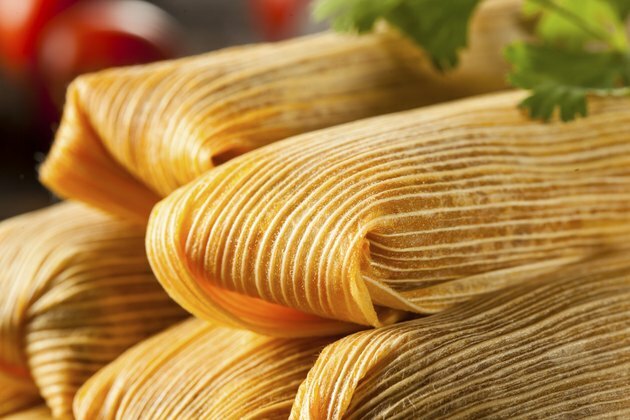 Homemade tamales are similar in calories to restaurant tamales, which have about 309 calories for a corn tamale or 247 calories for a pork tamale. A homemade pork tamale with chili sauce has about 270 calories. Using green chilies and chicken for a filling results in a tamale with about 287 calories. For a healthier tamale, replace the lard in the dough with part-skim ricotta cheese and fill your tamales with a mix of black beans, winter squash, chilies and goat cheese. You'll have more fiber and less fat in your tamale, which will contain about 232 calories. What Is the Best Way to Cook Perogies?